Larry W. Aylor started in the building business as a framing carpenter in 1973. He took drafting classes for four years and really enjoyed it. He found that designing and details came to him naturally. By 1974, he had framed over 40 homes for builders and decided it was time for him to start his own business which became Larry W. Aylor Custom Builder. He sold his first home (which was a spec home) when it was about 80 percent completed. He started another spec home and sold it when it was about 50 percent complete. He started pre-selling homes as people were beginning to see a difference in a Larry W. Aylor Custom Builder. The quality was apparent! 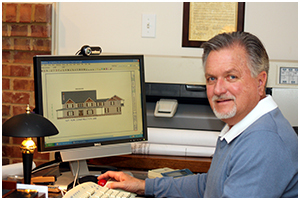 For forty years, Larry has been designing and building custom homes, additions, remodels and light commercial projects. A home by Larry exemplifies creative construction and design. He offers full service and a turnkey price. In addition to years of experience and knowledge, the benefits of a home built by Larry are many… superior craftsmanship, time enduring materials, economy minded and efficient products and very importantly, Larry personally oversees every project. His customers and subcontractors will tell you that his attention to details and organization are impeccable. He is your “go to” guy… no foreman or superintendents on his projects. he hires only the best independent, licensed and insured subcontractors. Larry W. Aylor Custom Builder offers personal service and peace of mind. Larry Aylor builds beautiful custom homes. We have known him for many years and had confidence that he would make our dream house a reality. He is a skilled contractor whose supervision, quality of workmanship and attention to detail are excellent. The quality of materials used in our home is above standard. He is very good about answering questions and making recommendations that make your house a home. Larry takes pride in his work and it shows.